From I-40, take the "Marine Corps Logistics Base" exit, which is about 2 miles East of the junction of I-40 and I-15. Go North for a very short distance and turn right to the main gate. There's room for a large rig to maneuver. Once through the gate, go 1/2 mile and turn right onto Wake Ave. Go past the childcare center and turn right again onto Tripoli Dr. A block down, you'll see the RV Park in front of you. Report to Bldg. 185 for payment and site assignment. Bldg. 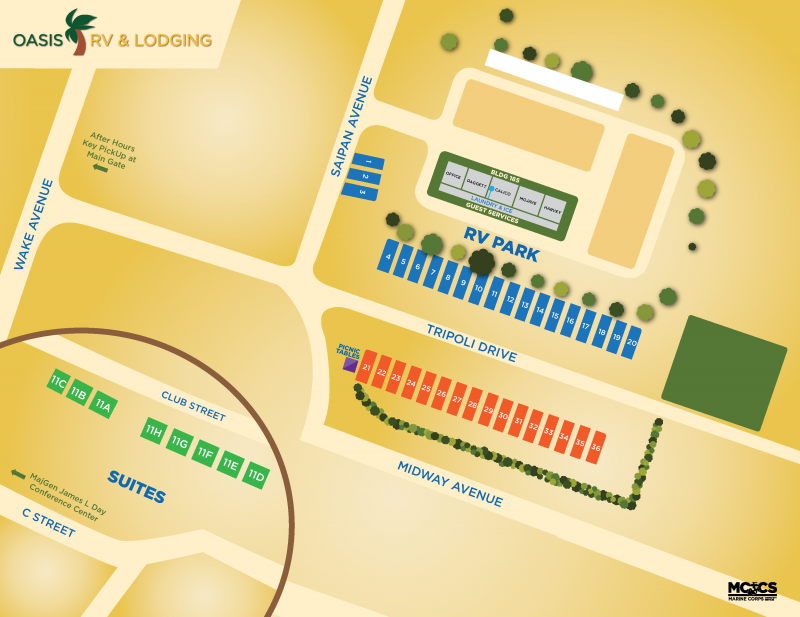 185 is directly behind the RV park on the South side, at the corner of the lodging. They're open 7 days/wk 7:30am-10:00pm. Active, National Guard, Reservists, Retired, 100% DAV, DoD/NAF Civilians. There is a laundry facility in Bldg. 185 (where you register). Showers are at the gym 1/2 mile away. For $35/nite this place is clearly not worth the cost – no bathhouse, no picnic table, tight spaces; you’re basically paying for a level concrete pad with full hook-up and nothing more. Close access to very small commissary and mini-mart style PX/gas station combo. After staying in numerous military FAMCAMPs, I agree with a previous reviews- the price increase is NOT justified- 20 bucks/nite would be more appropriate. We stopped here as an overnighter to resupply, refuel after a 7 hour day of driving in high-wind condition. We would likely not come here for a long-term stay. No frills, no nothing. Priced way too high for these sites. Lodging check- in is hard to find, signs are almost none existent. Melissa needs to be a bit more friendly and provide maps of base and surrounding area. 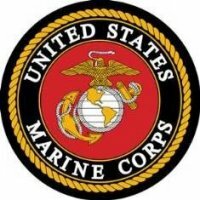 STAFF IS GREAT,PRICE RAISED TO $35.00 NOT WORTH IT.NO AMENITIES.MILITARY SHOULD BE ASHAMED ON HOW WE TREAT THEIR PATRONS.STAFF INFORMED ME THAT COMPLAINTS WERE MADE THRU DOD ICE SITE NO RESULTS.IT MIGHT BE TIME TO BOYCOTT MILITARY BASES THAT TAKE ADVANTAGE OF THEIR CUSTOMERS.THERE ARE BASES RAISING MONTHLY FEES $100.00.THAT REPRSENT A 20% RAISE. KNOWING WE GOT A 2% RAISE.WHAT NERVE! Great place for an overnight stop while traveling. Easy on and off Interstate 40. No pull-thru sites, but plenty of room to back our 44 ft. 5th Wheel and still have room to park our Truck. Nice level concrete pads full hookups. We did not visit the showers nor were we told if there were any. There was a loose dog that looked homeless, not sure if it was mean as we didn't give it a chance to act. Overall $29 for a limited military camp site seemed higher than average. Great place for an overnight stop while traveling. Easy on and off Interstate 40. No pull-thru sites, but plenty of room to back our 40 ft. motorhome in and still have room to park our Toad. Nice level concrete pads on north side and full hookups. South side is for long-term residents. Very clean and quiet. We're self-contained, so lack of amenities such as showers and bathrooms was no problem. They do have a laundry facility, but we didn't check it out. Office staff were great to work with and told us that they recently started taking reservations. But there were plenty of open sites while we were there. 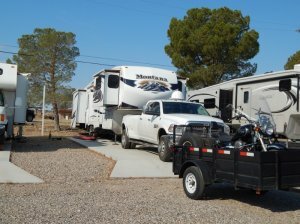 This RV Park had everything we needed and we won't hesitate to stop there again, even though it does seem a little high priced. This park is way overpriced for what is offered and being a military base. It works for an overnight stop, but that's about it. They have all the hookups, but that's it. Thankfully, we didn't need showers or bathrooms. There aren't any. The concrete pads on the north side are level, but could tell from looking, south side sites are quite unlevel. This park was on our way from Flagstaff, AZ to Port Hueneme, CA. (As previously mentioned, not worth the price, but better than driving too long of a day.) We stayed only one night in a 40' 5th wheel. We love when we have a pull-thru, but only back-ins here. No biggy though. The open area here makes backing anything easy. However, depending on which row you end up in you're gonna be backing down or uphill. We were in a site right in front of the office and had to put the truck into 4-wheel drive to push all the weight up the slope onto the pad. Thank goodness the electric was good since we arrived at 118 degrees and it only got down to 98 that night. Friendly staff. When we arrived, there wasn't anyone in the office, but called the number left a message and they returned our call within 5 mins. Told us which sites were available and to just come in and pay before leaving in the morning. Piece of cake. Won't plan any long stays here, but will know it's there when we need an overnight spot. As stated before, this park is a traveling park, not a stay park. Has fairly flat site with needed hookups. Personnel are friendly and helpful. Not much else to say about the park. We just stopped for the night on our way to Las Vegas. The only real negative is the price compared to other military parks. Yes they are $29 per night with the surrounding parks running at $45-50. But we stayed at Pensacola NAS for $20 per night and the parks around it are running $60 and over. So yes, they are overcharging. I guess they feel that you do not really have a choice so they got you. Not a good way to treat your troops. We just finished a five week cross country trip from FL to CA and back in May. We stayed at 9 military RV parks. All are very different. This was my least favorite park on the entire trip. There are level, spacious, concrete spaces. The lady that checked us in was nice and friendly. However, there is NO bathhouse, NO bathroom, NO clubhouse. Nothing really but the spaces. You have to go over to the gym if you need to use the bathroom or take a shower outside of your camper. AND it was by far THE most expensive park we stayed at ($29 per night while the others were $18-$20 per night). I cannot say we would stay here again unless we had to. New Commissary since the last time we were here. Usually stay at Edwards when traveling through this region however they were full in November and full this January 6th. If you like Edwards, a call ahead to check availability might be a good idea. Desert Rat is a good camp. Be advised they raised the daily rate to $29.00 on January 1st. Not a destination park, but just right if you find yourself looking for a place to stay on I-40 near Barstow. Easy access from the Interstate, friendly staff, level pads, good hookups. The commissary and BX (shopette) close early, but they are close enough to walk to from the park. Overall this is a good stopping point. Stayed here overnight on the way to Utah. Many concrete pads open. Easy to get in to sites. This is a bare bones campground but for a stopping place on the way while traveling it is great. Easy in and out from I15 or I40. Last time we stayed there was a large overflow on gravel. Now there are many more concrete pads with full utilities. 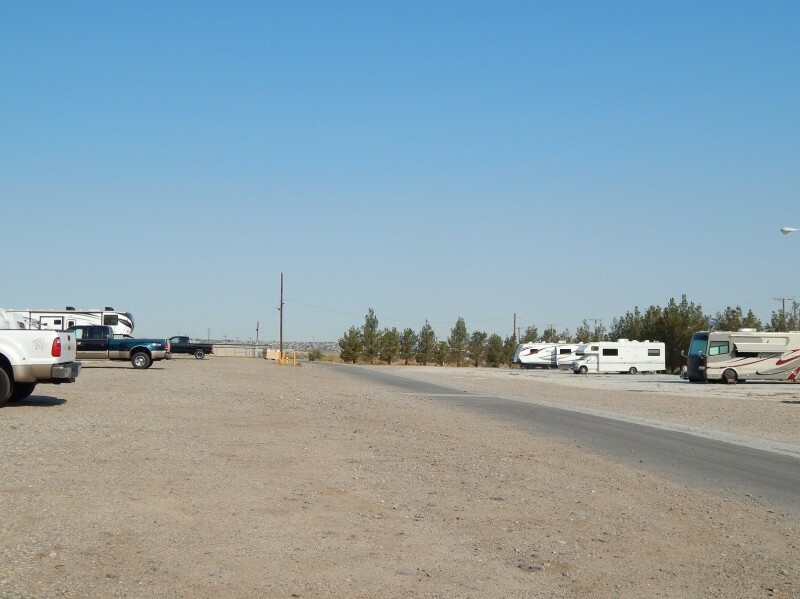 Desert Rat has added 11 more full hook up spaces, great job, we often travel between Yuma and Northern California, and Barstow was a so-so place to stop, we never knew if Desert Rat had any spaces open, because of the long termers and contractors, but with the addition of 11 more spaces should make a big difference, the rate $ 23.00 is pricey compared to other parks with more ammenities, the transformation is a welcome step. I have no complaints about this facility. 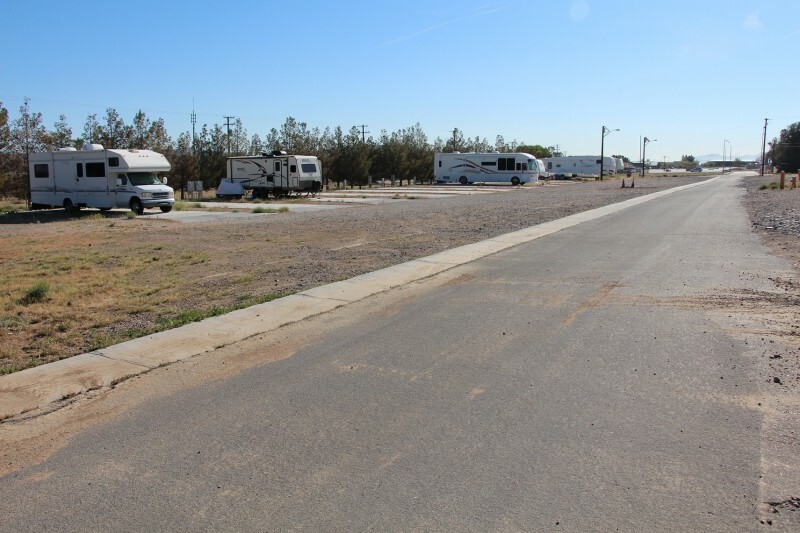 This was our first time as retired military to make use of the Military RV parks, and we found everyone we came in contact with at this base to be friendly and helpful. The night before we came to the facility we stayed at a local rv park for $33.70 for about the same amenities as this facility. We found out that the wife's ID card had expired and we were able to get it replaced in about 30 minutes and that is with waiting for the person in front of us to finish up. So if you are looking for a place to stay short term and not looking to be entertained you might want to try this place. Stayed one night while heading through. Retirees now pay $23 per night for FHU 50/30 amp, water and sewer, and a concrete pad. Price is too high for what they have to offer compared to other bases. (Pay at the lodging office behind the upper tier of the campground). Small commissary in walking distance, with small BX co located with gas station behind the commissary. For $23 might as well just stay in a local campground. Drove a little further this day to stay at Barstow. Left TN and headed up the coast through CA, OR and WA. This park is very easy to access from I-40. Civilian gate guard was very cordial. Called earlier in the day and was told there were 3 spots left and should be available. All the pads are concrete and look relatively new. In fact, there are 11 or 12 new sites that are not yet complete. Site had 30/50 amp service, water, and sewer. Commissary within eye sight; small but well stocked. PX was so so. Did not explore the town of Barstow. In short, this is a great place to pull off for the night. I would have considered staying a second night, but ready to head north. Rate I paid was $23.00. I thought it was interesting that this park had not been rated since Nov 2010. J.A. left this review using the Directory software: Base has not changed much since 1957 when I as Marine racked the grass! Ha-Ha. Good level concrete pads that you have to back up hill to get on. Good out of the way location for visiting surrounding desert sites. Will use again when traveling through Barstow. Recommend have correct change when paying. 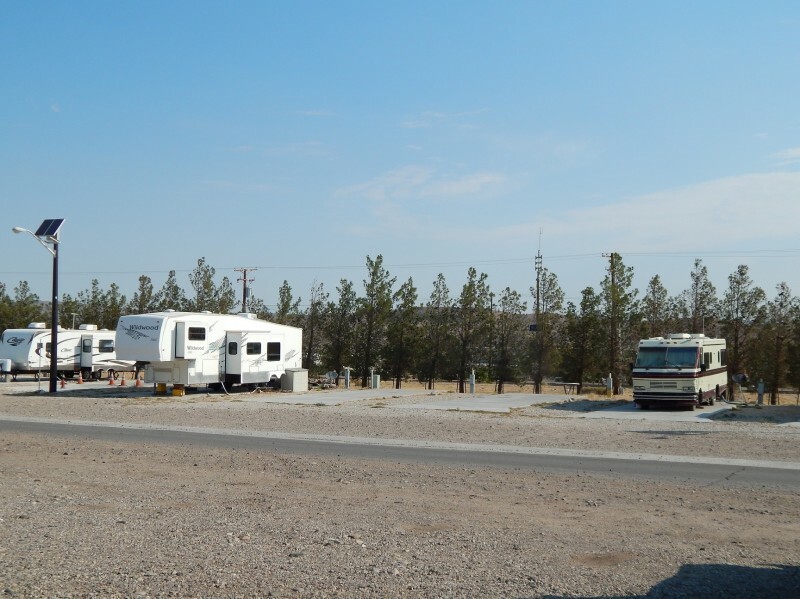 Campground is convenient to I-40 travelers. No frills. There is no shower/restroom at the campground. The camp gymnasium is about 1/2 mile so I drove over for my shower. Camp site was large enough, all are back-ins. I was able to get TV with antenna, and wifi was on-again, off again. As always, call to see if there are sites available. I will stop again if I am in the area! The location was great since we were just passing through. The base and campsite was easy to find and I could easily maneuver my 35ft trailer in the base and to the site. We called ahead as suggested and there were 3FH sites available and they were still available when we arrived. Large cement sites will accommodate any size rig. I wouldn't want to stay here more than a night since the town and the area really has nothing to offer in sightseeing. Had Wifi service but couldn't get any TV channels with our antenna and digital box. The staff was very friendly. Still no diesel at the base gas station. Very small commissary but has what you may need. Will stay here again if passing through.